Just like two plus two make four, when summer arrives, when summer vacation finally arrives, those old games that everybody has always played show up on the streets again with very few changes. And it’s on the streets because on our Island over half of our lives take place on the streets, outside our front doors. 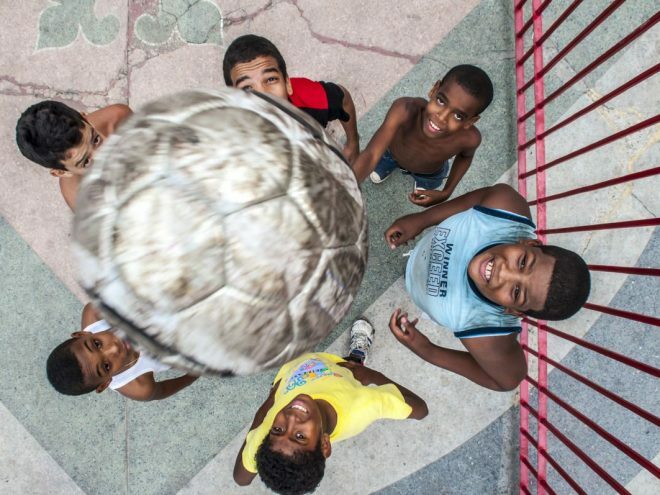 Starting with childhood games, the street calls us, incites us and demands our presence. First you see one kid outside his door, then another and another. Not long after dawn, rubbing the sleep out of their eyes, dressed in shorts (today’s shorts are the same ones worn yesterday and the day before yesterday), most are shirtless and some are shoeless…they look each other over without a word, and often without having had breakfast yet, and the rejoicing starts. An expert eye can make out four or five marbles in a closed fist. The challenge gets taken over to a corner. Marble hits marble, meters away, with an accuracy at hitting the target that’s worthy of Billy the Kid. The game goes on until there are so many playing that waiting for your turn takes forever until, suddenly, someone takes out a ball. And how much better can it get if you actually have a soccer ball? Or worse, depending on the neighbor’s attitude. Those soccer balls always need the company of scrappy old school desks to stand in for the goal nets. The goal that makes it through the legs of those desks gets more ovations and cheers than any one of those professional efforts by Ronaldo, Messi or Neymar because it’s not easy to handle a half-inflated soccer ball, evading six or seven devils on your tail and having it pass through a space that’s just one meter wide and half a meter high…now that’s what we call scorring a Goooooal! And what if we don’t have a baseball or a soccer ball or marbles? What if all we have is a tremendous desire to play? That’s when the miracles start happening. That’s when the “pegaos” and the “cojíos” take over and furious running back and forth ensues, playing hide-and-seek and God help whoever has left the door of their house open because the entire neighborhood is one big hiding place, especially that lovely little made-to-measure coffee table with the huge flat-screen TV on it. Then there is that eternal game of “bad guys vs. good guys” (cops and robbers) which often disintegrates into a shoving match, bad language and the occasional knock on the head. They have also been known to end in a shouting match about who did what to whom. By mid-, the exuberance has reached such a pitch that you can see neighbors shaking their heads and praying for a thunder storm, tsunami, tornado, earthquake…anything to calm down the noise in the street and let everyone finish sleeping in. If you’re lucky, nothing will happen. But if the gods that day are actually listening to these petitions, Armageddon is the result. Its starts to pour cats and dogs and contrary to what that neighbors had prayed for, what couldn’t get any worse suddenly gets worse. The water falling from the heavens refreshes all the black, white, mulatto, yellow and every skin color in between of all those impossible Havana kids. Whoever was tired gets energized. Whoever couldn’t go , suddenly has their motor running at top speed. And that’s when the real fun starts! Racing through puddles, splashing any poor devil that gets in the way, standing under the overflowing drain pipes…complete mayhem. But all good things must come to an end. There is a magic moment just at the end of the afternoon, not a minute earlier, when everything is over. You can hear the chorus of mothers’ voices all over the block yelling in unison: “Dinner!! !” Woe to the kid who doesn’t race home after that announcement. Chaos has ended. Neighborhood calm reigns supreme…until the sun rises again the next morning.